The What: Eiki International is now distributing TRT LED displays as part of its comprehensive range of projection and signage solutions. Suitable for hanging, wall-mounting, base-standing, bracket-standing, and other creative installations, the new TRT LED display panels are well suited for use at convention centers, shopping malls, meeting rooms, airports, gas stations, supermarkets, and clubs/restaurants, as well as command and control centers. The What Else: Used individually or as part of a multiscreen cascade, the TRT LedPoster screen provides a magnificent visual experience. 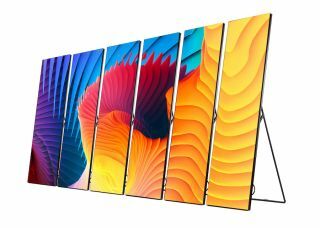 With a high 2880 Hz refresh rate and 1200 nits brightness, which is three times brighter than comparable LCD display panels, the TRT LedPoster provides a 160-degree wide viewing angle both vertically and horizontally, resulting in more realistic color reproduction. Each TRT LedPoster has a screen size of approximately 1900 mm x 600 mm (74.8 x 23.6 inches) and is viewable from a distance of 20 meters (65 feet). The Bottom Line: Available in two models—P 2.5 and P 1.9—the TRT LedPoster displays carry a respective dot pitch of 2.5 mm and 1.944 mm (0.0984 inches and 0.0765 inches, respectively). The display depth is 35 mm (1.3 inches) with an edge of 6 mm (0.24 inches). The frame size is 572 mm x 1902 mm (22.5 inches wide x 74.8 inches high). Additionally, each LED display frame has an integrated auto-closing inclined bracket, making setup for trade shows and other temporary display situations quick and easy.